Sony showcases, in a new commercial, released with the tagline “for and by Music Lovers”, its over ear noise canceling headphones MDR-1000X. 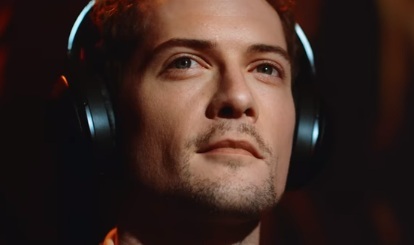 The brand highlights, in the 60-second spot, that you can escape into perfect silence to enjoy a deeper, more inspiring listening experience with these award winning headphones that tailor sound to your environment. A man with the MDR-1000X on is shown looking around him, at the people surrounding him, including a crying baby, with peace and serenity as if the can’t hear the noise. from his 2006 album, “Close to Paradise”. The 1000X Wireless Noise-Cancelling Headphones, designed to fit securely over your ears for hours of comfortable listening, featuring soft synthetic leather on the housing and earpads, are easy to store and easy to use by simply touching the gesture panel on the earpads to stop, play, skip through tracks, change volume or activate the smartphone’s voice assistant features. These headphones can be bought from various retailers at prices ranging from $348.00 to $399.99.